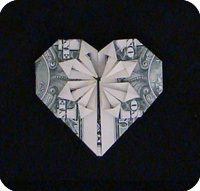 This Money Change of Heart model ($ Change of Heart) is often attributed to Stephen Hecht because he was the first person to use a dollar bill instead a sheet of plain paper. However, the model looks just as nice when you use regular paper of size ration 1:2. This model is not very hard or complex, but compared to the other models on this web site, it is more involved. 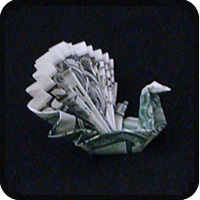 The model is challenging if you have large fingers because some of the folds are quite small and detailed. If you want, you can try with a larger sheet of paper and then move to a dollar bill after you have had some practice. 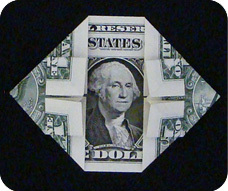 It’s a really nice dollar bill origami and it’s well worth the effort. 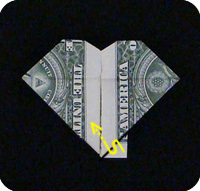 Fold the top corners down. 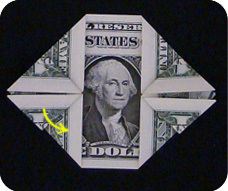 Fold up the bottom corners as shown. 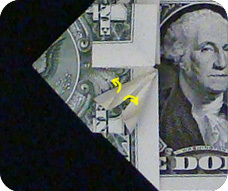 Notice how the crease marks create an X shape. 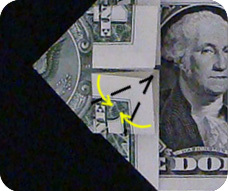 Turn the dollar bill over. 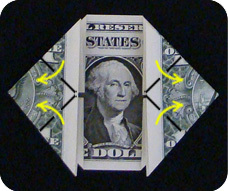 Fold in the left and right edges of the dollar bill. 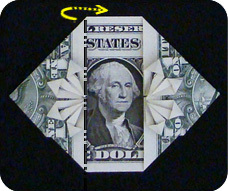 Make the fold so the crease intersects with the center of the X made above. 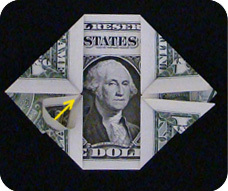 Unfold and turn the dollar bill over again. 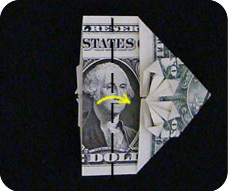 Pinch the dollar bill at the green arrows. This will cause the model to buckle. 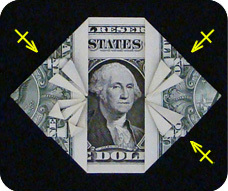 Keep pinching and fold in the edges of the dollar bill. Flatten completely. You have just made two “waterbomb bases”. Notice that the waterbomb bases have two flaps. 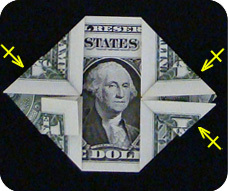 Fold the 4 tips of the waterbomb bases towards the corners of the model. Do a Squash Fold. First lift the flap. and press down (squash) evenly. 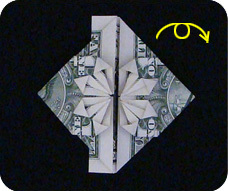 Repeat the squash fold for the other 3 flaps. 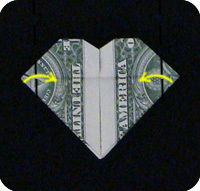 After the other tips have been squashed, you will see 4 small square flaps. 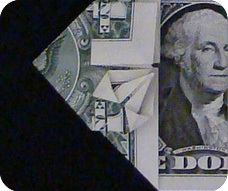 On each of the squares, perform another Squash Fold. 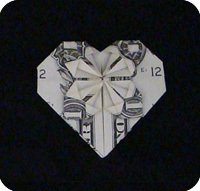 Fold in the edges of the little square so the edges meet in the middle. Pry open the layers of paper on both sides. 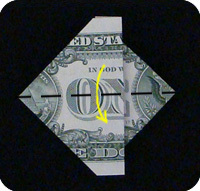 Repeat the Squash Fold on the other 3 squares. Mountain fold (fold back) the left side of the model. 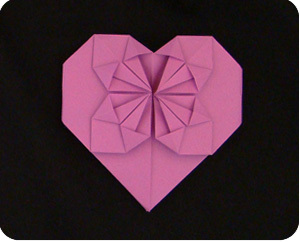 Valley fold at the center so the left side of the heart is adjacent to the right half of the heart. Fold down the top layer of the model. Valley fold the small (protruding) section of the model and then tuck it between the layers of the model. 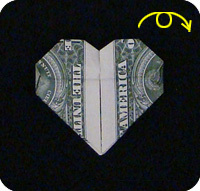 Fold in the left and right corners of the heart. Turn over and you’re done. 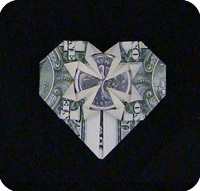 The reason this model is called Money Change of Heart is because you can side a quarter under the central points. 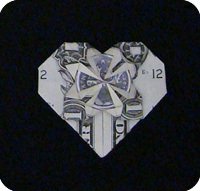 Some people think that a better name would be Change in Heart since the coin is in the heart. This is how the model would look like if you had started with the green-side facing up.